Greetings again from the darkness. Don’t come to me looking for objective judgment on Bond. By the time we hear that familiar opening trumpet blast of Marty Norman’s Bond theme, I’ve already been swept away into the land of MI6 enchantment – gadgets, cars, women, over-the-top stunts, globe-trotting, global villains and quintessential coolness. And it doesn’t help that this time director Sam Mendes treats this 24th (official) Bond film as an homage to those that came before. At times it plays like a tribute – and maybe even a closing chapter (for Mendes and Daniel Craig?). A long tracking shot drops us into the Day of the Dead festival in Mexico, complete with skeleton masks and giant parade props. We follow a masked couple as they maneuver through the crowd and into their hotel room, where 007 quickly leaps out the window and makes his way across roof tops towards his mission. It’s one of the more visually stimulating and explosive openings in franchise history. The story combines the personal back-story of Bond’s childhood with his relentless pursuit of the evil empire known as Spectre … the crime syndicate that has been part of the Bond universe for many years and films. The tie-in to the iconic Bond nemesis Blofeld, this new mastermind Franz Oberhauser, and Bond’s adoptive family make for an interesting chain of custody. However, as is customary, it’s the characters and action sequences that deliver the entertainment bang. Oberhauser is played by Christoph Waltz (understated given his track record), and the two Bond “ladies” are played by Lea Seydoux (the daughter of Mr. White, and the key to finding Spectre), and Monica Bellucci (the widow of Bond’s Mexico victim). Mr. Waltz takes advantage of his limited screen time, while Ms. Bellucci is limited to a few lines and a chance to model some lingerie. Reprising their roles are Rory Kinnear as Tanner, Ralph Fiennes as M, Naomie Harris as Moneypenny, Ben Whishaw as Q, and Jesper Christensen as Mr. White. New to the mix is Dave Bautista as Hinx (in the mode of Oddjob and Jaws), and Andrew Scott as C … the latest of those trying to shut down the “00” program. Whishaw brings a nice element to his role, while Bautista’s Hinx gets to participate in both a car chase and train fight … while uttering only a single word of dialogue. The evil doers have gotten more intellectual over the years, and Oberhauser and Spectre have the goal of global surveillance and controlling information and data. 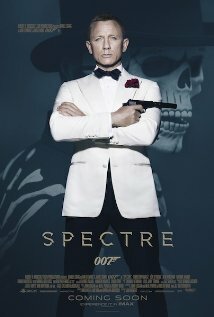 It’s a modern theme for a Bond film that also seems intent on reminiscing. There are nods to most (if not every) previous Bond film via (among other things) Nehru jackets, cats, scars, and a white dinner jacket. And it’s nice to see the gun barrel sequence back in the opening credits where it belongs. As for the new song, Sam Smith has a very nice voice, but his Bond song lacks the punch of the best. In terms of globe-trotting, we get Mexico, Rome, Tangier (Morocco), London and Austria. The (prolonged) car chase occurs on the deserted streets (and steps) of Rome and features two stunning cars – Aston Martin DB10 and Jaguar C-X75. In addition to the cars and previously mentioned train, it’s helicopters that earned a couple of worthy action sequences. It’s Daniel Craig’s fourth turn as Bond, James Bond. He brings his own brand of emotion and cheekiness, while also possessing a physicality that allows the action sequences to work. He has made the role his, much like Christian Bale took ownership of Batman. For those who refuse to accept the new generation, director Mendes delivers enough nostalgia that even the old-timers should be entertained. This entry was posted on Sunday, November 8th, 2015 at 5:33 pm and is filed under Action, Thriller, Uncategorized. You can follow any responses to this entry through the RSS 2.0 feed. You can leave a response, or trackback from your own site. I shall miss Craig’s Bond. At least I’m glad it was Spectre the choice for his last, for the reason you pointed out. Bond, is a standard of sorts.